Hard to believe its only November and we are already planning for Christmas, however there are good reasons to plan ahead at this time of year. The cash flow of your business can be particularly affected by the seasonal effects of Christmas. For example, staff expect to receive their monthly wages early, before the Xmas break - and in some cases there will also be Christmas bonuses due to be paid. At the same time, seasonal staff absences at your customers companies can mean that debtor payments are delayed, creating a cash flow problem. Whilst December may be busy for some businesses, in many sectors, December can be a quiet month, due to the number of public holidays, leading to a drop off in revenue, adding to the cash flow headache. There are a few actions that you can take to help solve your cash flow problems, and we set these out in our article: 6 Ways To Solve Seasonal Cash Flow Problems. 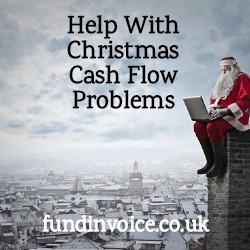 One way of improving your Christmas cash flow is to use an invoice finance facility. This type of finance short cuts the time you wait to get paid by customers by giving you the majority of the value of your sales invoices upfront, immediately you raise them. You still get the balance (less the charge for the service) when the customers pay. We can have a facility in place within a few days, so there is still time to make arrangements before the Xmas holiday period. There are different types of invoice finance which you can learn about in our free guide to receivables financing. However, there are two principle variations that are worth mentioning here. One type is what we call selective invoice finance. You can choose some outstanding sales invoices and release (normally 85% upfront) against them - the balance, less the fee is passed to you when your customer pays. The advantage of SIF is that you have no obligation to ever use the facility ever again. In that way, you could use it to get you over the Christmas cash flow hump, without being tied in to use it again. The other option is revolving invoice finance, whereby you enter into an ongoing arrangement to receive finance against all (or at least the bulk of) your invoices. This is more suitable if you have ongoing cash flow pressures that could be alleviated by receiving, normally 85%, upfront against all your unpaid sales invoices. This can smooth your cash flow on an ongoing basis, and give you working capital for other uses e.g. growth or expansion. Either option can be used to help smooth out your Christmas cash flow, we are always happy to discuss exactly what you require, just call us on 03330 113622..